Will the MNR seize this opportunity, or simply let these animals perish by way of nature or car accident??? 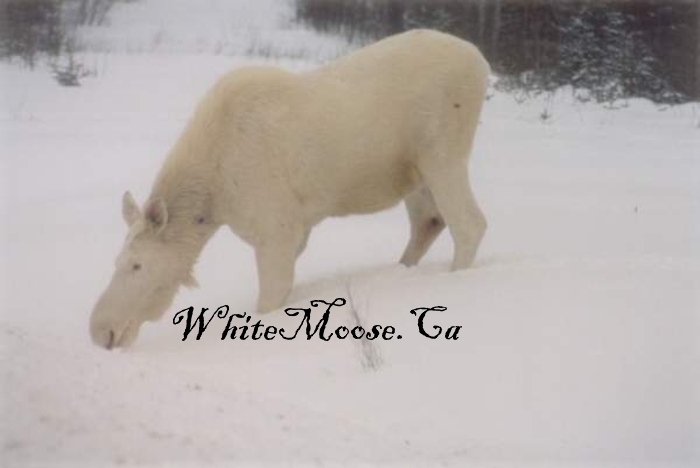 Subject: Re: Fw: White Moose Pic's. Maybe the best I've ever seen. whole CD, send me your mailing address and I will mail you a copy. like that on national television, crazy boy!! 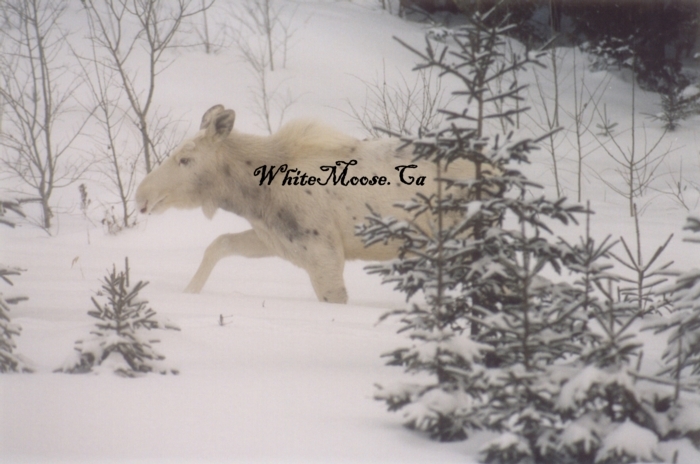 Subject: Fw: White Moose Pic's. Maybe the best I've ever seen. A good friend sent me these and they may be the best i've ever seen... The location is 20 miles from my house. I've seen (and hunted) the fork on the right of the road hundreds of times on my way to the Timmins. I think the calf with the grey patches is the Bull that was shot on the Ivanhoe 3 years ago, and the pictures, I'm guessing are about 12 years old. I think the cow was hit by the train in 1994, and thats based on the dark spot on her neck. See the pictures under the help us section if you're interested. So basically, I think that both of these animals are already dead (due to botched MNR wildlife management, AKA resting idle on the issue) but there are still 4 to 5 White Moose from the same genetic strain living in the area. Still waiting for a response from the Minister of Natural Resources regarding a live capture and putting one (or hopefully all) of the white moose into a very large fenced in, forested and natural enclosure (for their own protection and huge economic gains for northern Ontario). The letter is under the news section of WhiteMoose.Ca .... Waiting for the Ministers response, because the Minister is the only one authorized to make this type of order. However, at this point, I'm not sure that NDM, NOTO, or the MNR are allowed to consider diversity of employment or creation of new jobs for northern Ontario. 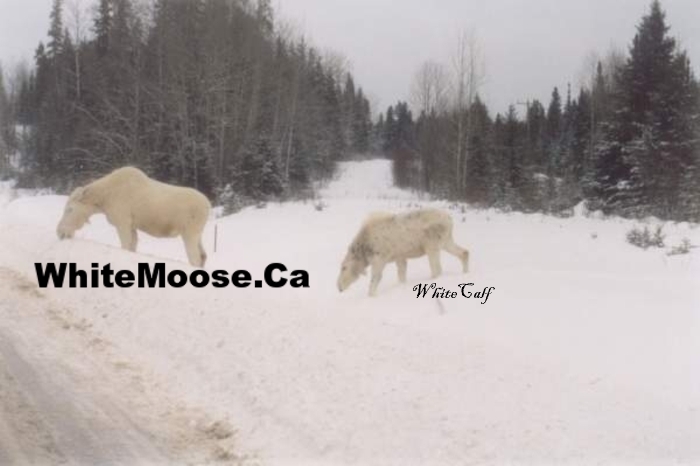 The MNR is allowed to consider a live capture of an endangered animal for an active breeding program, but thus far, the MNR seems to be indicating that they can't classify the white moose as an endangered animal. Odd that the white bears of BC called "Spirit Bears" and the white tigers are considered endangered animals while the white moose is not, because they all have the same genetic mutation (not albanism). Maybe we should debate the issue. Otherwise, it would seem that they would have taken the opportunity to capture a white calf 2 years ago in the vicinity of Foleyet when the cow was hit by the train mid winter (while trying to escape a pack of wolves). The animal disappeared and hasn't been seen since (likely eaten by the wolves). But maybe it was just a situation where the wrong people were contacted. I've been in correspondence with Richard Lafleur of Ceadar Meadows, and he's more than willing to house a (or a couple) white moose until the main (larger) facilities are built in Foleyet. He does currently have moose (and other animals) in a forested area at the ranch, and has already had sucessful natural breeding on the facilities. 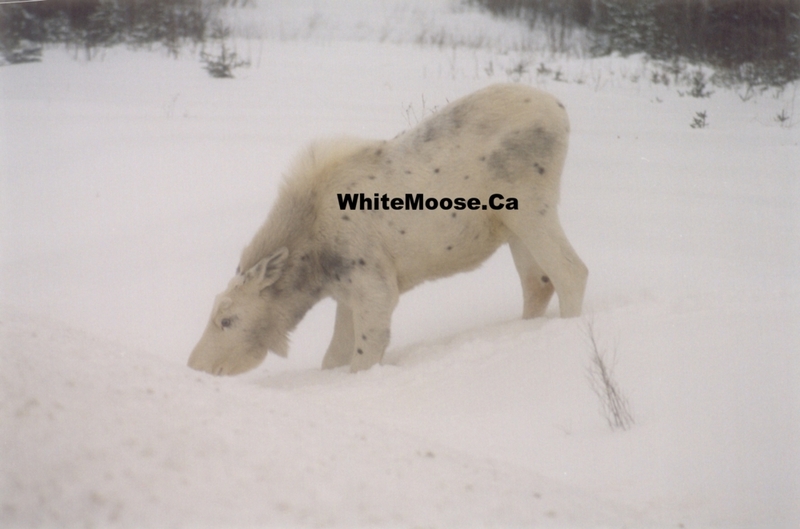 Foleyet seems very willing to house the white moose, with the main constraint being financial (as it is a small town and they're barely getting by now). The idea is a natural enclosure, where we get to show off the white moose for their beauty and genetic diversity, while guests tour the "Model Forest" that the animals are living in. I've been told that Cochrane recieved a multi-million dollar FEDNOR grant to build their polar bear facility in the hopes of bringing new jobs and diversity of employment to the city. Anyone wanting to help could contact our FEDNOR reps, to see if they would once again be willing to invest in the Ontario economy. There are tens of thousands of polar bears, and less than 15 white moose in the world. I think a natural facility with large, wooded and water areas, would meet the demands of animal rights groups that oppose putting animals in cages (I oppose the idea as well), while protecting the genetic diversity, and creating new employment for an area, curently largely devoid of stable industries and employment. It would definitely draw more attention and $$$ MONEY $$$ than the polar bear facility ever could. The forestry section is up and running, and i'm working to get a couple more guestbooks / forums in that section so that everyones efforts regarding herbicides and forestry methods can be put together, rather than having all of us work separately and much slower to accomplish the tasks at hand, one of which being a solution which meets the needs of all parties regarding herbicides in forestry application. As always, if you liked the pic's or info, please forward them on to your bud's. And yes, much of my correspondence with MNR, NOTO, NDM, and Ontario's forestry companies is on the web (so everyone can figure out where everyone else stands) and then we can debate the issue openly.